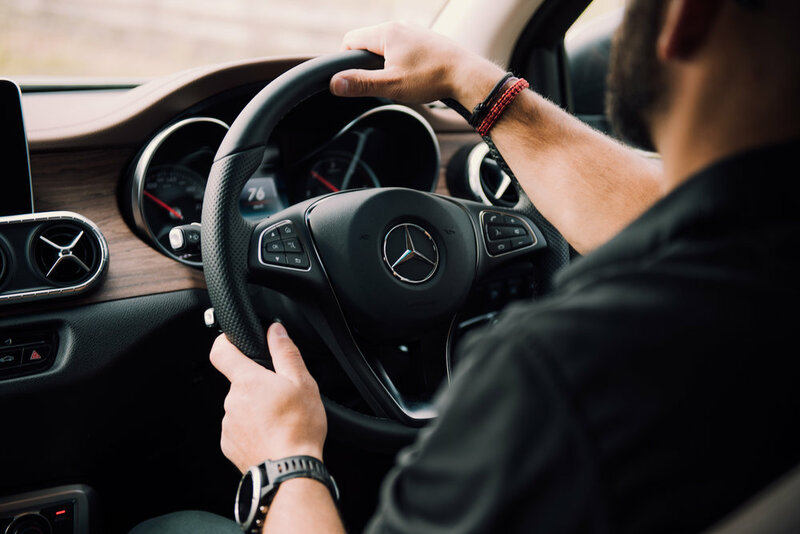 WHEN announcing his brand was entering the one-tonne utility sector, Daimler chair and Mercedes-Benz chief Dieter Zetsche explained there were two reasons why it made sense to start with an existing vehicle. Working with the Renault-Nissan Alliance and creating a vehicle off the Japanese marque’s Navara allowed, he attested, his brand to “drastically reduce the time and cost” involved in developing such a model. He got the first bit right: X-Class was announced in 2015. The global reveal occurred a year ago. The international media drive was last November. And now the model is on sale here. Even taking into account that the bones of the deal were obviously settled before Zetsche spoke out, essentially the whole project went from computer screen to the showroom in three years. That’s a remarkably quick turnaround. Toyota and Ford might relate the market-dominating Hilux and Ranger respectively had much longer gestations. Whatever amount was put into the starter pack D23 Navara when it launched in 2015, let alone what was spent in the subsequent two upgrades, has never been revealed and the Germans, for their part, are tight-lipped about what their subsequent spend came to. Yet these days, the fat end of $NZ1 billion is not exceptional for the kind of ground-up programme that Nissan undertook. So let's imagine that much went into getting Navara out. Now, the Benz. From everything that the X-Class relates in feel, look and driving attitude, I’d feel confident in suggesting many, many more millions of Euros came out of a German bank account. Okay, so entry Pure models have black grilles and steel wheels, but the upmarket Power specification looks every inch the premium machine it aspires to be and does nothing to erode consumer perception that Benz product is a cut above the rest. All that for a mere change of badge and a couple of exterior panels? Well, there’s the thing. Even though the Nissan and Mercedes remain relatively similar in silhouette, that’s as close as they get to being doppelgangers. From every other angle, and aspect, the departure from original form is clear. A face that is so clearly related to the company's line-up of SUVs fits naturally to a body that is widened. Even those parts that appear to be carried over (such as the doors) are, in fact, not. Beyond that, there’s the significant tech upload, no small amount of mechanical revision and God only knows how much minor tweaking. The more you spend, the more it feels spent upon, but there’s a patent impression that every model is a more polished package. They’ve taken a Japanese model that, quite frankly, felt a bit under-developed when it came out (though, apparently, it has improved through two major revisions, themost recent effected earlier this year, with at least one more update to come before year-end) and turned it into something far more special. Which is all fitting, because Benz wanted its truck to be premium, even those editions that quite patently fit out for work ahead of play. The price for that is … well, a higher price. Showroom showdown with Navara is not wholly pointless. Yes, the donor kicks off at a much lower level – the recommended retail for a base Navara is $37,990 against $53,330 – this for a base singlecab Mercedes, with steel wheels, an unpainted front bumper and outputs of 120kW/403Nm – they do close up at the other end. Recommended retail for Nissan’s flagship ST-X doublecab is $64,490; the highest-positioned Mercedes star, the X250d Power, is $69,000. With the exact same powertrain in identical tune: 140kW/450Nm. So, not so far apart, right? And yet, of course, they will be, due to every Benz being subject to cost-extra upgrade packages that, while deemed optional, are really quite necessary. The core box ticks are Comfort (electrically adjustable front seats with lumbar support, dual zone automatic climate control, Artico leather/Dinamica microfibre upholstery, and a stowage net in the front passenger footwell) and Style (LED headlamps and part-LED tail lamps, an electrically opening rear window, tinted rear windows, side running boards, roof rails and 18-inch six-twin spoke light-alloy wheels). The X250d Power was pretty much the sole focus of the media launch and, from what I could tell, practically none were in standard form. The example I took from downtown Auckland to our off-roading venue, Kauri Bay Boomrock near Clevedon, was typical of what a customer might end up with. Having been implemented with the Style and winter (heated front seats, heated windscreen washers) packs, then also given keyless go start, hill start assist, Comand nav, the theromotronic air con, Bluetooth connectivity, a load bed lamp and an adjustable load securing system, this one represented as a $75,890 buy-in. A pretty standard fitout, Benz reckons. Notwithstanding that utes benefit from a taxation structure that allows them to become tax-efficient company cars and lifestyle vehicles, by about now you’ll be understanding why conjecture that the X-Class six-cylinder is destined to become the country’s priciest one-tonner is surely on the money. Still, with 70 percent of Kiwi interest zoning straight into four-wheel-drive doublecab diesel autos for Benz the question is not if the high-end fare will sell but, rather, what percentage of the overall X-Class tally it will account for. Benz won’t offer thought but concedes that it is possible that perhaps within as little six months some of the lesser editions within its 13-strong current range (not a huge, count, by the way – Hilux offers in 21 formats) will likely be retired, or at least relegated to special order status. It certainly understands that utes, though beasts of burden at heart, sell even more strongly as recreational playthings and family runabouts here than in Australia. For all that, Benz is keen to relate that the X-Class has the longest deck in the class – if beating Navara purely by dint of having a new tailgate (though that, and changes to the load bed are enough to ensure no Navara canopy will fit the Merc) – and has all the off-road toughness you’d want, including decent wading ability and – as we found out – ability to ride a 45 degree sidling without tipping over. The more powerful of the two can also tow 3500kg. In those respects, it stands up well with any other rival designed to be part workhorse, part family transport, able to combine heavy-duty load carrying or towing with transporting the family around and being a fashionable recreational vehicle in out-of-work hours. Of course, that’s not enough. Even though the brand is at pains to point out that this is a product from the commercial side of the family – the one that otherwise represents the Sprinter and Vito vans here – Kiwis will still prefer to connect it with Mercedes’ cars. So, really, it is inevitably going to be compared with the passenger fare in respect to finish, fitout and driving ability. Can it stand the heat? Let’s say it does better than expected. Clearly, miracles cannot be expected: There’s no ute yet that full emulates a car in comfort, let alone driving attitude. 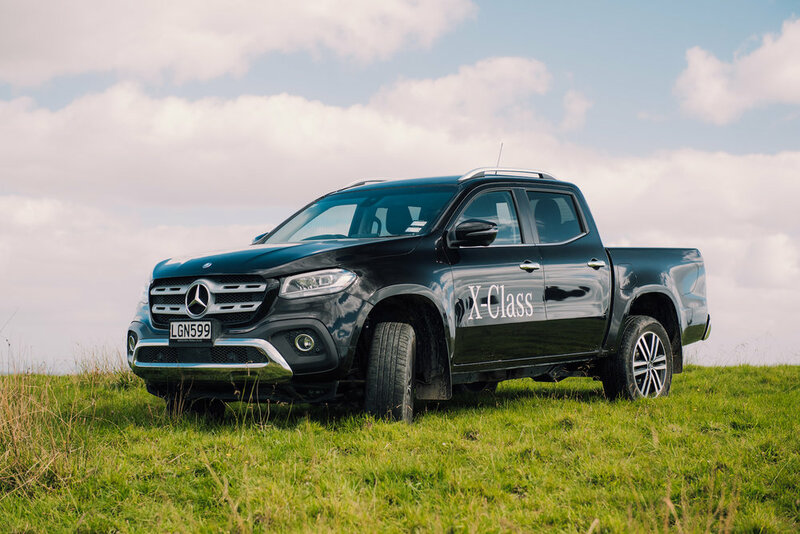 Yet the X-Class nonetheless raises the bar enough that any Benz fan keen to shift into something different yet is also still shares fundamental familiarity with their family car or sports utility will likely be genuinely impressed. The Power’s Alcantara and leather interior is the plushest and most visually appealing I’ve yet seen in a one-tonner. The front seats, also from the Benz car line, are potentially the most comfortable in this category. Subsequent time spent in a Navara suggests the Germans have also placed their chairs lower, which presents a superior if not wholly car-like driving position. The whole top part of the dashboard appears to be plucked straight from a C-Class car. Unfortunately, it is it is not a complete cabin reconstruction: The horizontal line running beneath the air vents and bisecting the dash is a separation point. Everything above is Benz; a lot below is still Nissan and the contrast in material quality is something of a class division. Up top, a soft, padded, contrast-stitched leather upper portion of the fascia and a band of trim – in wood or metal look – a genuine Mercedes steering wheel and crisp instrument cluster behind further up the ambience levels. Plus, of course, that big Comand centre screen, driven by its swish looking accompanying controller, again plucked direct from the road cars. Look low and you’ll see cheaper plastics better sorted for hard graft and a lot of rather plain controls directly lift from the Navara. The ergonomic shortcomings of having buttons in locations where they can only be felt but not easily seen (such as the starter and the switch to operate the auto-sliding rear window) are not solely down to Nissan; from cross-checking that Navara, it appears Benz has shifted some that were logically sited in the donor to less suitable positions. It’s astounding that Mercedes went to the effort of removing the original separate indicator and wiper wands and replacing them with its own trademark single dual-function stick, on the left-hand-side of the steering column as per ‘correct’ Euro convention. Likewise, in giving its truck a digital speedo readout, as you get in its cars, Benz has provided a feature yet to be emulated by the Navara. But not all challenges have been overcome. As in the Navara, the steering column does not reach adjust. In having to locate the Comand controller between the seats, as per Benz cars, they’ve built over the best open oddments space in a Navara. There’s a lidded console further back into which your phone will have to go; not only because it’s the only spot big enough, but also because that’s where the USB ports are. And one really weird thing: It still has a Nissan key fob, rather than the far more affluent looking Mercedes type. X-Class delivers some useful additional crash-avoidance tech above the Nissan level – standard automated emergency braking is a category-first, while blind spot and lane keep alert is still on Nissan’s (and some others) wish list - and quite rightly arrives with a five star NCAP score. It’s a pity the four-cylinders miss out on Distronic active cruise control and perhaps limitations of the electronic architecture are why the sat nav consistently made slightly late calls in inner city driving. X-Class also lacks Apple CarPlay and Android Auto interaction, though this is to be addressed as a running change. Mercedes’ claim to having done much work in places you can't see to ensure that the X-Class feels suitably improved also shows in the quality of the driving. Mercedes didn’t try to change the basic suspension design – no need when the Navara already delivered something special with a multi-link rear axle and proper car-like coil springs. In ute-dom, you can’t get a more sophisticated set-up. Still, the Germans were allowed carte blanche to tweak. They certainly didn’t hold back, changing springs, dampers, bushes and geometry. Also, the X-Class has a wider track than the donor. Maybe the VW Amarok – which is leaf sprung - has better overall ride quality, but the X-Class potentially resets every other parameter. It delivers a decently cosseting gait and is quite possibly a tighter vehicle through the bends. Steering that is necessarily (for off-seal duty) slow-geared also has a pleasingly even turn-in feel on the twisting roads. The handling was reassuring, because the X-Class keeps its body movements well in check and actually has a lot of mechanical grip at both axles, so it sits confidently even when unloaded. All in all, you could just as easily compare with a similar-sized SUV as another traydeck. Refinement is a word rarely used in association with this kind of vehicle, but it can be applied on this occasion. The Benz dislike for tyre and wind roar is evidenced in all its cars; now, it seems, the ute must also conform. It’s not as whisper-quiet as some big Merc sedans, of course, but still sets a remarkably high standard on coarse chip. It’s the work to suppress engine noise that impresses even more. That’s generally not a priority for ute makers and the 2.3 has never been the quietest or most refined mill. You can still hear it in the Benz, yet the volume of the intrusion is definitely lower. The secret? Sound-proofing and plenty of it. Interestingly, while Mercedes has not reworked the engine, it did lay dibs on the transmission’s electronic management, and effected extra smoothness. There’s every likelihood that the X250d might well be the best of the four-cylinder bunch. But here’s another truth: It almost certainly won’t be the best X-Class. That accolade will assuredly go to the one yet to come, the X350d, simply because it has Benz’s best diesel, its best transmission and a more complex and competent all-wheel-drive system than the switchable Nissan setup. The X-Class is by no means a cheap way to travel; but that’s unlikely to inhibit market acceptance. High-end utes, after all, are the strongest sellers of all traydecks. Which means, additionally, that even if the lesser four-cylinder variants prove to be less exciting, that will hardly matter. Benz really only needed one to hit the spot. To date, the X250d is it.